SXnavo ITS include the application of advanced information processing (computers) communications, positioning and control technologies and management strategies in an integrated manner to improve the functioning of the public transport system. These systems provide real time information to the travellers and increase the safety and efficiency of the ground transportation system. 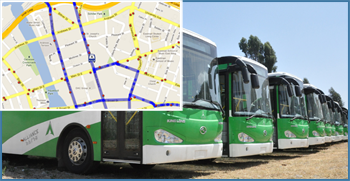 ITS is a synergy of both the GIS and GPS technologies and provides dynamic information about the bus routes (arrival and departure of any vehicle) with reference to the traveller. For example, a traveller will be able to know when and how far her desired vehicle is from her current location. ITS is bound to encourage use of public transport by reducing the use of personal vehicles significantly, contribute to saving the environment from heavy vehicle pollution, decrease the carbon footprint and ease congestion on city roads. This is achievable because ITS brings in benefits, which include improving the accessibility of the system, safety of users, traffic efficiency, environmental quality, energy efficiency and economic productivity. Also, it reduces waiting time for the traveller, travel uncertainty, fuel consumption, emissions, operational costs and traffic congestion. Most importantly, SXnavo Intelligent Transport System increases the satisfaction of the public and creates a positive atmosphere towards increasing the usage of Public Transport. Providing effective, safe, environmental and commuter friendly solutions to the travelling public who use buses. Track and monitor the movement of buses on real time basis to enable communication of the arrival timings of buses at the bus stops through state of the art GPS/GPRS technologies. Inform commuters about the bus routes and arrival timings of buses at the bus stops/terminals through LED Display systems. Effective management through a Decision Support system by collecting, collating and storing information on real time basis about the transport system and its effectiveness using communication technology. Instant access to information related to bus schedules, ETA (Expected Time of Arrival), ETD (Expected Time of Departure). Facilitate timely management of Incidents/Accidents. Obtaining on-line real time information on bus operations and management. Effective monitoring of break downs and the related information. Effective diversion of traffic in case of emergency. Monitoring accidents and the related aspects.